We’ve included two schedule views to help you maximize your time at EWE. 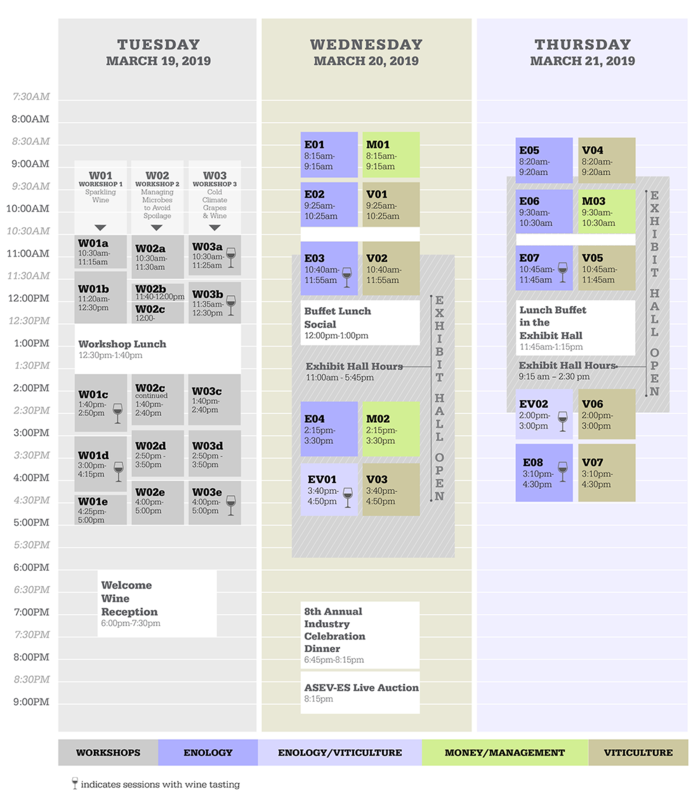 The Schedule at a Glance is the high elevation view, allowing you to see in one glance all the events, functions and happenings taking place in three days. Below it is the Daily schedule which provides the details. Use the interactive schedule below to learn more about each event at EWE. Start by clicking on one of the three tabs to view that day in more depth. Scroll to see more detailed descriptions of each function. EWE Conference sessions are color-coded by track. From prosecco to cava and sparkling moscato, sparkling wine is experiencing a boom in popularity with American consumers. Given the Eastern climate’s bright acidity for early-picked grapes, Eastern wineries can take advantage of this trend. This workshop will start with enologic tools for base wine preparation, then move into processing specifics. We’ll examine traditional method sparkling wine production, in two phases, then a session on alternative carbonation methods like petillant naturel or pét-nat along with forced carbonation and transfer methods. We’ll conclude with a Q&A session on sparkling wine packaging and marketing issues. Major wine microbes’ development and faults, including two sensory sessions of microbial wine faults. The proper use of anti-microbial agents and their effects on wines. How to detect microbes in wines and the importance of being proactive with an early detection of microbes in the cellar and wine. Sanitation and microbial control is essential to produce quality wines. All winemakers, enologists and cellar workers will benefit from this workshop. In recent years, new hybrids from the University of Minnesota, Cornell, and Minnesota grape breeder Tom Plocher have produced sustainable viticulture with superior grapes in cold climates from the Upper Midwest to New England. At the same time, cold climate vintners continue to use select Swenson and French hybrids either as varietals or blends. This workshop will showcase successful white and red wines made from a range of hybrids, with sessions on increasing the odds for sustainability and cold hardiness at your site. Tom Plocher will discuss Petite Pearl and his new releases, and his new focus on grape breeding for the changing climate. All Workshops take place 10:30 am – 5:00 pm. However, the modules within each workshop vary by timeslot. Pay close attention to start and end times noted within each description when planning your EWE schedule. Steve and Michael will provide an overview of available tools in the preparation of sparkling base wine, from the juice up to tirage. They will cover nutrition, clarification, stabilization, adjuvants for riddling, and appropriate yeasts for primary and secondary fermentations. Eglantine will outline the major spoilage microbes that affect wine, how they grow and manifest wine flaws. Winemaking tools and practices available to manage, negate or suppress spoilage microbes in wine will also be discussed. Three winemakers will pour and discuss their medal-winning wines, an eclectic mix of varietals and blends from Minnesota and Swenson hybrids. Viticulture and Enology details will be included. These traditional method sparkling winemakers will discuss details of their processing in the first stages, with data on harvest parameters, grape varieties and ratios, press time and pressure, free run vs. press wine, yeast preference, primary and malolactic fermentation time and temperatures. Eglantine will explain and associate wine flaws and off-flavors associated with spoilage microbes development. Attendees will experience in a sensory (only olfactory) evaluation. Molly will explain the need for proper winery sanitation in reducing the risk of unwanted microbial activity and the importance / methods of early detection of microbes in the cellar and wine. This session breaks at 12:30 pm for lunch and resumes at 1:40 pm. 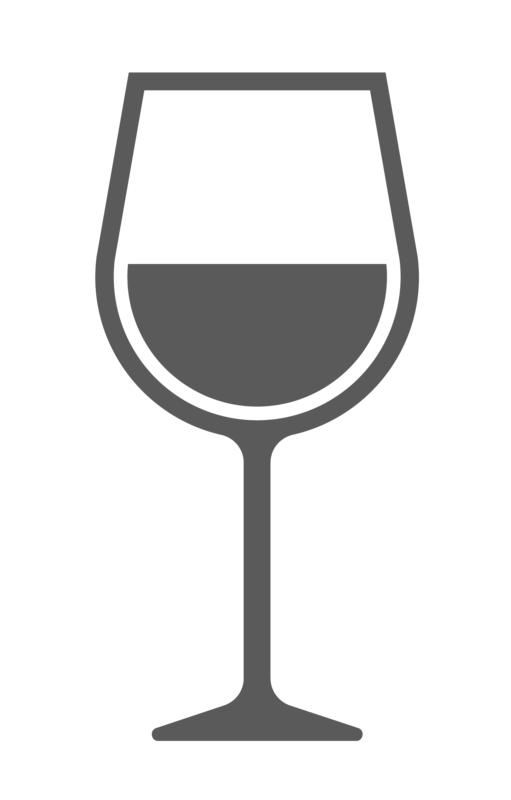 Many northern winemakers wonder whether varietal reds or blends are better. These cold climate winemakers will pour and discuss medal-winning reds that include both varietals and blends. Viticulture and enology details will be included. The panelists will shift to the second fermentation in bottle, time en tirage, blending lots including other grapes and older reserve lots, dosage, riddling and disgorgement, bottling, and time in bottle before release. In viticultural regions with spring freeze events, early budburst increases the risk of vine damages, compromising industry long-term sustainability. Marquette is a cold hardy hybrid with Vitis riparia in its parentage, a source of cold hardiness and rapid budburst characteristics. Michela will present data collected in Pennsylvania on defensive pruning strategies to reduce the risk of spring frost damage specifically with marquette vines. Paolo will discuss research results which suggest that marquette has the potential to generate significant yield with desirable fruit quality even after a series of freeze events. Maya Hood White will speak on pét-nat sparkling wine, an ancient process for sparkling wine that is now getting trendy. Tim Benedict and Ben Stamp will cover forced carbonation sparkling wine and the machines they use, and Steve DiFrancesco will speak on the transfer method. Some of the most common wine flaws, which can lead to spoilage, develop when oxygen allows microbes in the wine to develop. Eglantine and Molly will work together and present a second sensory (only olfactory) evaluation of flawed wines based on microbes interacting with oxygen. There are many factors–starting with site selection–which will influence whether your vines will be damaged by winter freeze episodes. Many are beyond the control of the viticulturist once planting has occurred, and the most costly change will be the rejection of the selected site for viticulture. Paolo will discuss the importance of effective, timely application of cultural practices appropriate for the location of the vineyard and the cultivars being grown. He ads a caveat that nurture cannot produce hardiness levels above those made possible by the vine’s genome, and inadequate and poorly timed practices can negatively influence the expression of the genes the vine possess for cold hardiness. The panel will field questions from the audience on packaging and marketing issues for sparkling wines. In this roundtable session, skilled winemakers will discuss their harvest and cellar practices used to manage microbial issues in the winery. Essential sanitation practices as well as innovative, new technologies will be discussed. Twenty-five years ago the focus of cold climate grape breeding was on combining great mid-winter hardiness with good wine quality. Varieties such as petite pearl, crimson pearl, verona, and marquette emerged from this era. While mid-winter hardiness is still important, cold climate grape growers now are faced with the new challenges associated with climate change, including greater variation of temperatures in late fall and early spring, late spring frost, heavier rainfall, and migration north of invasive insect species such as Japanese Beetles. The goal now is to develop new varieties for the future that are more sustainable and resilient to these new challenges. Formula wines (those with non-wine flavorings like vanilla, chocolate or colors added) are taking off in popularity–and can have a host of both chemistry and regulatory issues. This session brings a consultant enologist and an alcohol legal expert together to explain the most important things to know, and the TTB resources to use, in getting approval for your formula wines, from both the TTB and your customers. This session will feature a legislative and regulatory update from WineAmerica, the National Association of American Wineries. The discussion will focus on the impact of federal public policy on the American Wine Industry, with a specific focus on Eastern wineries. Topics will include excise tax reform, trade policy, USDA project funding, TTB regulations and the impact of the 2018 midterm elections. The session will highlight WineAmerica’s work on behalf of American wineries in Washington, DC and why it is important for Eastern wineries to be engaged at the federal level. Michael will take a look at select alternative and non-traditional yeasts, their uses in the winemaking process with an eye towards Eastern issues / environments, and their potential beyond simply converting sugar into alcohol. Join Matt and Maya as they share their knowledge of vineyard mechanization. Matt will discuss his experiences in managing a successful commercial vineyard operation, sharing his insights into best commercial vineyard practices which can help you best utilize your resources to achieve profitability. Maya will focus on mechanization implemented to supplement hand labor in vineyard management. She’ll touch on mechanization types to include management of undervine, fruit zone, canopy and cover crop. Two variations on conventional fermentation are (1) using native (wild) yeasts, and (2) using multiple, simultaneous commercial yeasts in the same fermentation. James Callahan will speak to native yeast, Michael Reidy will address concurrent inoculation of multiple commercial yeast strains as well as consecutive inoculations. Consulting enologist Denise Gardner will discuss the pros, cons and risks of these variations. Michela and Maya will present data on studies with different grape varieties in different states (PA and VA). Michela will present data collected in Pennsylvania on lemberger and riesling with defensive pruning strategies to reduce the risk of spring frost damage. Maya will discuss frost and cold damage mitigation in grapevines in central Virginia, with a focus on the techniques implemented to lessen vine damage and crop loss due to frost and freezes. Techniques primarily include pruning strategies for cordon and cane pruned vines, as well as use of sprays and heat sources. With the rise of alternative packaging, wine (and cider) in cans is becoming common. Two Eastern winemakers explain why they diversified into canning, the pros and cons, the equipment necessary, cost and market considerations such as recycling, and the advantages of non-glass containers. Jay will provide guidance and tips for a profitable winery operation including the art of pricing your wine. He’ll discuss how to educate your customer and manage your business. Attention will be given to the secret of working on your business rather than working in your business. He will provide the basics of how to determine the cost of each bottle you produce, including an overview of the key metrics comprising the cost accounting process. Discussion will also focus on setting the correct profit margin in conjunction with the development of a working budget. Various tax matters concerning production costs will also be discussed. Industry statistics show that sauvignon blanc is rapidly growing in popularity in the American market. Although small as a percentage of Eastern varietal white wines, outstanding sauvignon blanc in a regional style is now being produced across the East, giving producers a chance to showcase a popular, classy white alternative to chardonnay. Panelists will share viticultural highlights and processing regimens, and how they decide their styles. As pressure on land, water and labor resources has intensified, Precision Viticulture (PV) has emerged with the central objective of optimizing efficiency in vineyard management, encouraging growers to graduate from management strategies where one-size-fits-all. Jackie will discuss her research with the Efficient Vineyard project, funded by a USDA-NIFA Specialty Crop Research Initiative grant, showing how spatial data drives decision-making and mechanization in commercial vineyards. This, along with some variable-rate upgrades, makes it easy for growers to turn those decisions into profit. Andy will discuss how geomatic technologies are strongly applicable to viticulture. Eastern soil characteristics range widely in texture, depth, and water-holding capacity. This variability in soil characteristics can impact vine vigor, yield, water status, and potential wine quality. Such spatial variability is detectable using remote sensing, using conventional aircraft and drones, and can thereafter be exploited for economic gain. Andy’s team has had substantial experience in use of drones to delineate zones of different vine water status, grapevine leafroll infection, and wine sensory quality. Tom will discuss tried-and-true lab analysis with sound, understandable principals. He’ll cover testing sugars prior to and after fermentation, pH, titratable acidity, malic acid, alcohol, SO2 levels, aroma trials, heat stability trials, sweetness lab trials and more. He’ll also cover how to make the lab comfortable and organized, giving you confidence while rationally interpreting the results, and how to keep the lab cost- effective on a long term basis. Spotted Lanternfly is an invasive planthopper that came to the U.S. and was first discovered in Berks County, PA in 2014. Despite efforts to contain and eradicate this pest, it has spread to 13 counties in Southeast PA and found its way into Virginia, New Jersey, and Delaware and in September of 2018, Albany and Yates Counties in New York State. Spotted Lanternfly has been shown to be a significant pest of grapes in the quarantine zone in Pennsylvania leading to a decrease in vine size, winter hardiness, return crop and marketability of the crop for fresh market, juice or wine. This session will focus on the basic biology of the Spotted Lanternfly, correct identification of all life stages, how and when to scout, and management strategies for this invasive pest. The East has a big advantage over warmer climates with bright, fresh fruit, which is popular with consumers. How can we ensure that the fruit stays forward in the finished wine? This session focuses on processing steps pre-fermentation through the end of primary fermentation. This session will focus on tax strategies and tips for winery and vineyard owners in terms of how the new federal tax reform law impacts their operations. Learn about specific considerations for wine producers that can help them stay in compliance while lowering their tax liability. Session E06 focuses on maintaining freshness of fruit from the end of primary fermentation to bottling. In this session the winemakers will share their insights on racking, fining, filtration and more, gained from decades of winemaking experience. Maria will focus on depth or lenticular filtration. Cabernet franc has become the most widely planted Vitis vinifera red variety in Ontario and elsewhere in eastern North America. It presents several viticultural and enological challenges. In recent years a focus on viticultural practices to rectify these issues have included cluster thinning, early season fruit zone leaf removal to encourage breakdown of methoxypyrazines, and lengthy “hang times” of 3 weeks or more. Several clones have likewise been acknowledged as superior to many others, particularly ENTAV numbers 214, 326, and 327. Post-harvest, utilization of appassimento techniques have assisted in concentrating ripe fruit flavors and reducing pyrazine aromas. Dr. Andy Reynolds of CCOVI at Brock University will review the ways these techniques have helped transform cabernet franc in the east, while Cameron Hosmer of Hosmer Vineyards will share what he has learned with cabernet franc over the last 28 years as a commercial grower/winery operation. Dry rosé has exploded in popularity across the U.S., especially near sophisticated urban centers, and the East has the natural advantage of high natural acidity and bright fruit across the varietal spectrum. Every Eastern winery should consider dry rosé, not only for consumer popularity but for cash flow with its release the spring after harvest. The panel members all make impressive dry rosés using cabernet franc or pinot noir. They’ll discuss viticultural highlights, blend ratios, fermentation regimen, oak vs. stainless use, style choices and consumer response. Caroline will focus on Pestalotiopsis, recently identified as a fungal pathogen affecting grapevine trunks as well as clusters. Pestalotiopsis was brought to her attention by Lucie Morton, a viticulturist working out of Charlottesville, Virginia, when she found symptoms associated with the fungi in a number of her clients’ vineyards. Pestalotiopsis was the fungi isolated most abundantly in a spring sampling, as well as a late summer sampling, of hundreds of primary buds in Virginia. This presentation will address; the results of an ongoing study looking at the ability of Pestalotiopsis to create and spread lesions within grapevine trunks, the relationship of Pestalotiopsis isolates found in Virginia (using results from an ongoing sequencing project), and provide an overview of Pestalotiopsis as a pathogen affecting grapevines. This presentation is intended for plant pathologists as well as grape growers. In the last 15 years cabernet franc in the East has evolved from a curiosity, often made with virused plant material planted on the wrong rootstocks on the wrong soils, full of weedy bell pepper twang, to an elegant French style wine, fit for showcasing the best of Eastern terroir either as a varietal or a blend component. Session V05 explains what has changed on the viticulture side, and this panel of three Eastern winemakers will pour and discuss wines that should make us re-think cabernet franc today and how it can be well expressed in very different ways, ranging from the fresh, unoaked style to high-end reserve wines. Controlling fungal grape diseases has always been a challenge in the Eastern U.S. The wet 2018 growing season was a prime example of how challenging disease control can be for many growers of the Northeast. Bryan will start with a review of the major fungal grape diseases; the biology of the organisms that cause them, which weather conditions favor their growth and development to epidemic proportions in a vineyard, and the role that site selection plays in their control (or lack thereof). He’ll also discuss what tools we have to combat these fungi, including a review of the chemical fungicides available – what diseases they control, how best to use them, what’s new in the pipeline for 2019 – and cultural controls and practices that can reduce our dependence on fungicides. Bryan will also cover varietal susceptibility to the various diseases and how variety impacts the sustainability of our disease management programs, especially in wet seasons. Throughout the session, he’ll compare conventional and organic/low impact grape production in this context of grape disease control. Paul has been using biological vineyard practices with vinifera vines. He will discuss his experiences with biological controls during 2017 & 2018. EWE Show Management reserves the right to make changes to the program and speakers, or to cancel sessions if enrollment criteria are not met, or when conditions beyond its control prevail.